The new 17-inch MacBook Pro arrived a little late to the unibody makeover party—most of Apple’s laptop line switched to the thinner and lighter, precision-crafted aluminum design back in October 2008. But the new 17-inch laptop is not without under-the-hood innovation. The incremental updates that boost processor, system bus, and RAM speeds are all welcome, but the big news with the 17-inch MacBook Pro is its new battery design. Apple says the new laptop’s battery is 40 percent larger than the battery in its 17-inch predecessor ( ), allowing the new 17-inch MacBook Pro to run for up to 8 hours on a single charge. The new 17-inch MacBook Pro comes with the same 5,400-rpm 320GB hard drive as the model it replaces, though you can customize the laptop with a faster 7,200-rpm drive of the same capacity ($50), or choose between a 128GB ($300) or 256GB ($750) solid state drive (SSD). Like its predecessor, the new laptop comes standard with 4GB of RAM (you can upgrade to the maximum 8GB of RAM for $1,000), but the memory is now of the DDR3 variety running at 1,066MHz instead of the 667MHz DDR2 RAM used previously. The new laptop uses a 2.66GHz Intel Core 2 Duo processor, up from 2.5GHz in the last generation, though with the same 6MB of L2 cache, and for $300 more you can upgrade to a speedier 2.93GHz processor. The new 17-inch MacBook Pro also features a 1,066MHz front side bus, up from the 800MHz front side bus in the previous 17-inch MacBook Pro. Like all of the unibody laptops, the 17-inch MacBook Pro uses an environmentally friendly widescreen display with mercury-free LED backlighting and arsenic-free glass. The screen has a native resolution of 1,920-by-1,200 pixels, and with that many pixels occupying just 17 diagonal inches, it’s easy to have multiple windows open at once. If you’re used to working at lower resolutions (like I am), you’ll notice that everything onscreen appears much smaller. I found myself having to zoom my Office documents to 150 percent in order to work on them, something I don’t have to do with my 15-inch MacBook Pro and its 1,440-by-900 native resolution. The new MacBook design puts the glossy screen behind a thin sheet of glass. Glossy screens can look great with bright vibrant colors and deep, rich blacks. Some people, including a few of my fellow Macworld editors, despise the glare from these highly reflective glossy screens. For those gloss-phobic folks, Apple offers an anti-glare option for $50. We weren’t able to look at a 17-inch MacBook Pro with an anti-glare screen for this review. The previous 17-inch MacBook Pro had the optical drive slot located on the front right; in the new laptop, it’s still on the right, but now on the side. All of the ports are now on the left side. I find it handy to have USB ports on both sides, but I’m sure I’ll learn to stop blindly stabbing cables into the optical drive before long. For connecting an external display, the new Mini DisplayPort takes the place of the full-sized DVI port from previous generations. At this time, Apple is the only company using Mini DisplayPort, and the only Mini DisplayPort LCD is Apple’s 24-inch LED Cinema Display ( ). Unfortunately, Apple doesn’t include a Mini DisplayPort to DVI adapter to let you connect the new laptop to the more prevalent DVI connector found on most displays-the adapter costs $29 from Apple. 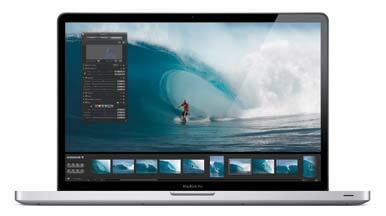 As with the 15-inch unibody MacBook Pro, the new 17-inch MacBook Pro has a dual graphics subsystem—a high performance Nvidia GeForce 9600M GT chip with 512MB of dedicated GDDR3 memory, as well as a lower-performing, battery-saving GeForce 9400M that shares 256MB of RAM with the main processor. The previous 17-inch MacBook Pro had a single graphics engine, the Nvidia GeForce 8600M GT with its own 512MB of GDDR3 memory. Our tests found that the 9600M GT graphics offeres a significant boost over the 9400M; the 9600M GT was 45 percent faster in our Quake tests and 18 percent faster in our Unreal Tournament tests. The big story with the new 17-inch MacBook Pro is its battery life. The new battery is created with lithium polymer sheets instead of cylindrical lithium ion cells; this, according to Apple, creates less wasted space. Another way to make the battery bigger is to make it a fixed part—it's no longer user replaceable, a controversial decision to say the least. By not having to include the latches and other parts necessary to make a battery easily removable, Apple says it was able to increase the size of the battery so it can carry more juice. Apple also says that the battery’s new adaptive charging technology will significantly increase the overall life of the battery, claiming that it can be drained and charged at least 1,000 times before retaining 80 percent of its original capacity–that’s between 3 and 5 times as many charges as most laptop batteries. Though it’s difficult to test Apple’s 1,000 charging cycle claims, we ran other battery tests to see how long a single charge lasts. Our standard test involves looping a video at full screen from a ripped DVD saved to the hard drive, the display set to full brightness, and the Energy Saver preferences set to never sleep and to use the lower-powered Nvidia GeForce 9400M graphics. In that test the new 17-inch MacBook Pro lasted 4 hour, 43 minutes, while the previous 17-inch MacBook Pro lasted 3 hours, 36 minutes, and the new 15-inch 2.53GHz MacBook Pro ( ) lasted just 2 hours, 46 minutes. Our next battery test closely resembles Apple’s wireless productivity tests used for its battery life estimates. We used the same Energy Saver preference settings as our video loop test, but we set the display to half brightness and then used the laptop to surf the Web over AirPort and work on office productivity apps like Microsoft Excel and Word. In this test, we were able work for just over 7 hours before the laptop entered its safe sleep state–about an hour short of the 8-hour battery life claim, but still impressive. The test result on the other two laptops: 4 hours, 42 minutes for the 15-inch 2.53GHz MacBook Pro; and 4 hours, 46 minutes for older 17-inch MacBook Pro. Longer bars are better. Blue bars in italics represent reference systems. Macworld Lab testing by James Galbraith, Chris Holt, and Jerry Jung. As you’d expect, with a slightly faster processor, the new 17-inch MacBook Pro outperformed its predecessor, but just a tad; the new system was about 1.8 percent faster in our all-around system performance tool, Speedmark 5. Most tests, however, like Photohop, iMovie and iTunes were all within a second or two of each other. We posted an analysis of the benchmarks earlier this week; check out the benchmark analysis of the 17-inch MacBook Pro for a more in-depth look at the performance results . 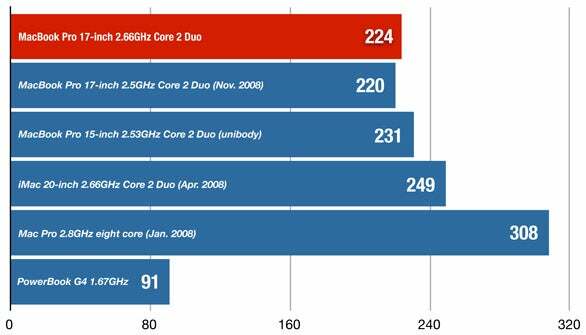 Speedmark 5 scores are relative to those of a 1.5GHz Core Solo Mac mini, which is assigned a score of 100. Adobe Photoshop, Cinema 4D XL, iMovie, iTunes, and Finder scores are in minutes:seconds. The 17-inch MacBook Pro systems were running OS X 10.5.6. All other systems were running Mac OS X 10.5.5. The unibody MacBook Pro models had 4GB RAM, the rest were tested with 2GB of RAM. The Photoshop Suite test is a set of 14 scripted tasks using a 50MB file. Photoshop's memory was set to 70 percent and History was set to Minimum. We recorded how long it took to render a scene in Cinema 4D XL. We used Compressor to encode a 6minute:26second DV file using the DVD: Fastest Encode 120 minutes - 4:3 setting. In iMovie, we applied the Aged Film ffect from the Video FX menu to a one minute movie. We converted 45 minutes of AAC audio files to MP3 using iTunes’ High Quality setting. We used Quake's average-frames-per-second score; we tested at a resolution of 1,024 by 768 pixels at the Maximum setting with both audio and graphics enabled. We duplicated a 1GB folder, created a Zip archive in the Finder from the two 1GB files and then Unzipped it. To compare Speedmark 5 scores for various Mac systems, visit our Mac Hardware Guide.—Macworld Lab testing by James Galbraith, Chris Holt, and Jerry Jung. The new 17-inch MacBook Pro has a lot going for it, from the faster processor, front side bus and memory speeds, to its thinner and lighter, unibody design. Add in a new battery that lasts longer per charge, and you’ve got yourself a winner. If you’re not a fan of glossy screens, the 17-inch MacBook Pro is the only Apple laptop with an anti-glare option. And though the decision to lock away the battery behind 10 screws and a warranty voiding warning sticker is controversial, the fact that battery itself will last at least 3x as long as the battery in the previous 17-inch MacBook Pro should certainly lessen the sting.